Description: A pair of new paint scheme CSX units, lead by the 4822, accelerate a northbound empty coal train from main 2 onto the single main @ the NEDT Trent. Note special CSX sign @ left. Description: A westbound train crosses the bridge over the Erie Canal. Description: Being sent to home raod. 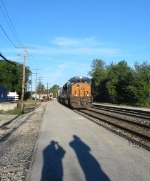 Description: Q437 sits at the west end of West Springfield with CSX 4822 and 4794 leading. Description: Q171 rolls around west a wye before the heavy rains rolled into town. Description: Once the "mess" out in Onieda on the Chicago line was cleared, things started rolling again....9 trains this day between 07:30 and 11:00, 7 of which were eastbounds. This is Q420 at MP 138. Description: SD70AC 4822 pulls CSX general freight Q439 westbound through Bailey's Wye with the City of Baltimore making a nice backdrop. Description: a stack train heads east in the last light of the day. Description: CSX G352-11 is headed east through Akron, Oh with the Firestone Co. looming in the background. Description: CSXT Q410, 16:17 hrs.